Are you discouraged by your crooked smile but don’t want the embarrassment or discomforts of traditional braces? For teens and adults, that reluctance can disappear with clear acrylic aligners from Invisalign dentist, Dr. Yelena Obholz, in Washington, DC. Removable and comfortable, Invisalign aligners transform smiles in a way that’s easy to live with. Become informed on Invisalign and get all your questions answered. Many people refer to Invisalign aligners as clear braces. Made from biocompatible acrylic, this orthodontic system is a practically invisible way to improve smiles disfigured by gaps, crowding, tooth rotations, underbite, overbite, open bite and other alignment issues. Customized in a special Invisalign lab according to your dentist’s treatment plan, Invisalign aligners in Washington, DC resemble professional teeth whitening trays. They fit snugly over top and bottom teeth, steadily moving them into more attractive and healthier positions. Older teens and adults really love their discreet appearance and how easy it is to maintain them. Following are some questions you may want to ask Dr. Obholz if you are contemplating Invisalign treatment for yourself or for a loved one. Through careful oral evaluation and a personal discussion of your smile needs and goals, you and Dr. Obholz will determine if Invisalign is the best choice. Treatment with Invisalign averages about one year, less time than traditional metal or ceramic braces take. Usually, patients wear their 18 to 30 aligner pairs (depending on the case) for most of a 24-hour day, removing them for only for meals and to brush and floss. Compliance with wearing the appliances keeps the treatment plan on track. 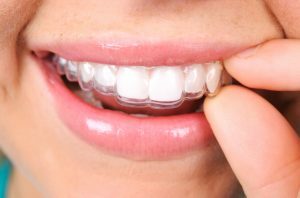 Who Can Get Invisalign Aligners? Teens through senior adults who have healthy teeth and gums may qualify for Invisalign. In general, children do better with traditional braces; so the youngest of Invisalign patients are ages 11 to 19. To determine candidacy, Dr. Obholz does a complete oral exam and takes digital X-rays, three-dimensional imaging and photos to formulate a care plan. Very complex orthodontic cases usually require traditional brackets and wires. However, people are amazed at the kinds of smile problems Invisalign fixes. In short, unless your smile issues are very complex, you like will qualify for treatment with Invisalign. How Will My Day to Day Life Be Impacted? Invisalign patients live comfortably with their aligners. They may remove them for meals, brushing and flossing and for special events such as weddings and graduations. There are no dietary restrictions as with traditional braces. Patients simply enjoy the healthy foods they always have. However, diligent brushing and flossing are critical. Tobacco stains the aligners; so patients should remove their aligners when they smoke. Additionally, the soft tissues of the mouth experience little to no irritation as with metal braces. So, patients are comfortable wearing smooth Invisalign appliances for the required 20 to 22 hours daily. How Frequent Will My Dental Appointments Be? Invisalign patients check in with Dr. Obholz every six weeks or so for progress checks and to receive the next aligner pairs in their treatment plan.These visits are quick and easy because Invisalign aligners need no complex or painful adjustments. Millions of people wear Invisalign aligners. Should you? Learn more during a one on one Invisalign consultation. Contact Aesthetic & Family Dentistry of Washington today for an appointment with Dr. Obholz, and bring all your questions. She will be happy to answer them. You may be on your way to a beautiful smile with Invisalign.